JUST LISTED! This is the One! Completely Renovated! - Shannon Doser Group and Assoc. JUST LISTED! This is the One! Completely Renovated! Welcome home to 10435 Haskins Street in the Century Estates community of Lenexa. This COMPLETELY RENOVATED 5 bedroom, 3 full and 1 half bath home is located in a quiet neighborhood on a corner lot. You will appreciate the fresh paint inside and out, new electrical components and plumbing, new hardwood flooring and trim, new stainless steel appliances, granite counter tops, formal dining and breakfast room, finished walk-out lower level with wet bar, and a new rear deck built in 2018 for entertaining. Additional upgrades include a newer roof, hot water heater, heating and air conditioning systems, all replaced in last few years. 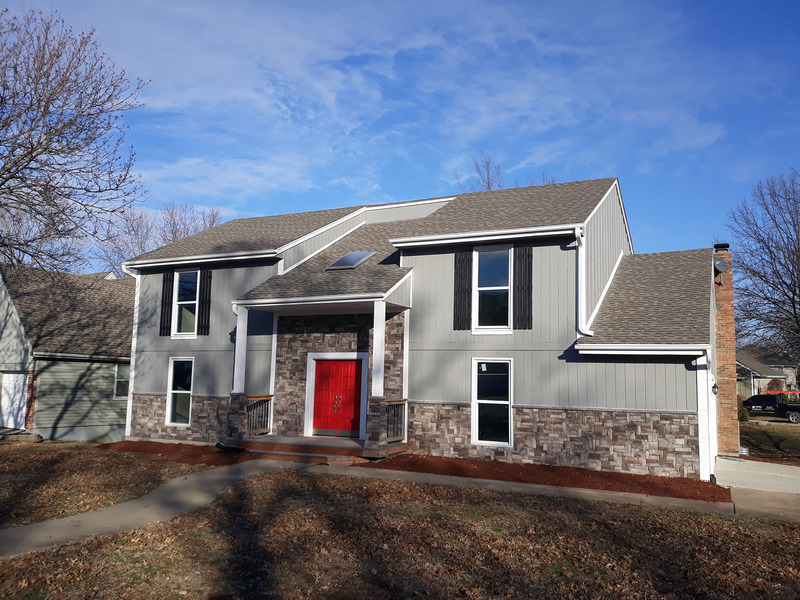 This home is also located within the award winning Shawnee Mission School District. Be welcomed home by the covered front porch and stone accents that invite you into the soaring 2-story foyer with skylight. Once inside, take note of the fresh paint and gorgeous hardwood floors found throughout the main level. The hardwood floors flow from the living room to the formal dining room with chair railing. The fully equipped kitchen features hardwood floors, granite counters, stainless steel appliances, a pantry, and granite peninsula illuminated by chic pendant lighting. Appliances include the refrigerator, microwave, gas range, dishwasher and disposal. The kitchen is open to the hearth family room offering a cozy wood burning fireplace framed by a stacked stone surround and built-ins. French doors lead to the expansive rear deck for easy entertaining. The laundry room is located off the kitchen, and there is a powder room for the convenience of your guests. Ascend the gorgeous staircase to the primary bedroom level. The incredible master suite highlights a vaulted ceiling with impressive lighted ceiling fan, skylight, and barn style door leading to the private master bath showcasing a double vanity with modern vessel sinks, and a gorgeous walk-in tiled shower with mosaic accents, bench seating, accoutrement niches, over-sized rain style shower head, and separate shower wand. There are three additional bedrooms and the second full bath on the upper level. Downstairs, the spacious finished walk-out lower level features a wonderful rec room, complete with wet bar and built-in wine rack, the 5th bedroom, and the third full bath with extensive tile work and a shower over whirlpool tub. Outside, you will love to spend time on the new back deck built for entertaining and spanning the length of the home. There is also an attached 2-car side-entry garage with automatic opener and keyless entry.